The main restaurant of the resort, the Coral Restaurant serves breakfast, lunch and dinner in a laid-back buffet style making it easy to pick and choose exactly what you would like for your meal. You’ll find tasty Mediterranean dishes such as antipasti, soups, pizza, pasta and salads as well as freshly prepared grill. 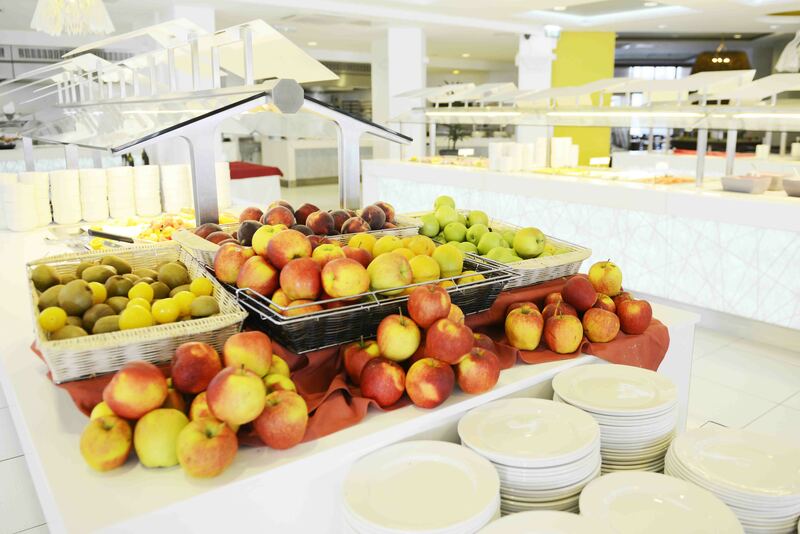 Also serving breakfast in a buffet style, you will be able to enjoy both hot and cold breakfast options; from pastries to a full cooked breakfast. It’s the perfect way to set yourself up for the day ahead. If you are craving some authentic Italian cuisine, then the La Pellicola Restaurant is the perfect spot for you. This trattoria-style restaurant boasts traditional themed interiors with famous Italian movie posters decorating the walls, giving the restaurant an intimate and cosy air. 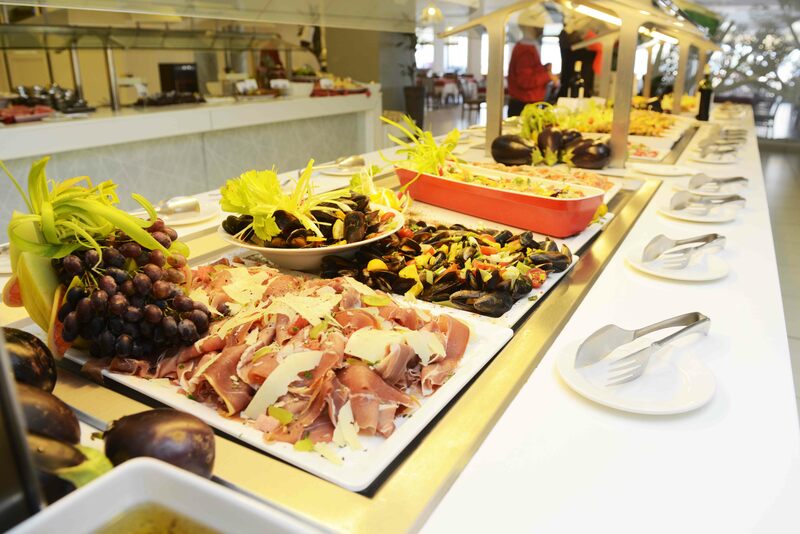 The buffet dinner boasts Italian favourites from hearty soups and mouth-watering antipasti to incredible pastas, pizzas, freshly caught fish and traditionally made meat dishes with fresh vegetables. That’s not even mentioning the incredible desserts including tiramisu cake, torte di mandoria and biscotti mousse. The incredible L-Orjent Asian Restaurant is a dining experience not to miss during your stay the db Seabank Resort & Spa, especially if you are a fan of Oriental cuisine. This Asian fusion restaurant serves up sushi, duck and pork dishes, mixed fish, noodles, rice, vegetables and more in serious style. 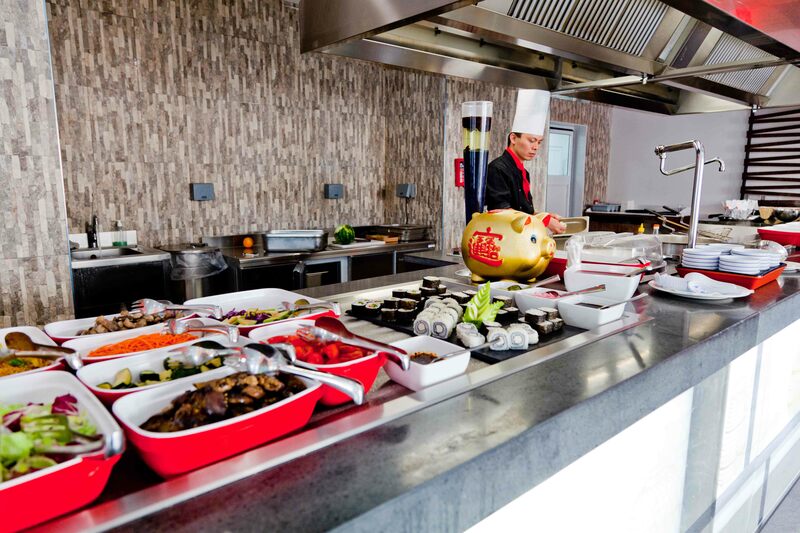 All items are prepared directly in a buffet right in front of you, meaning that you can enjoy the very freshest of Asian flavours to your taste in a lovely setting. The resort boasts its very own Brazilian meat restaurant on site, the El Rodizio Brazilian Restaurant, which is must-visit for any meat lover. Pork, beef, chicken, and lamb are cooked in the authentic South American way over a Churrasco grill to ensure the most tender and tasty grilled meat. Served alongside chimichurri (a traditional spicy sauce made from parsley, garlic, olive oil, vinegar and chilli flakes) you can enjoy as many dishes as you like. In addition to the grill, there is also a buffet serving sides and a wide selection of delicious desserts if you can find the room! This family friendly restaurant is a firm favourite with guests seeking a fun and entertaining restaurant for their children. 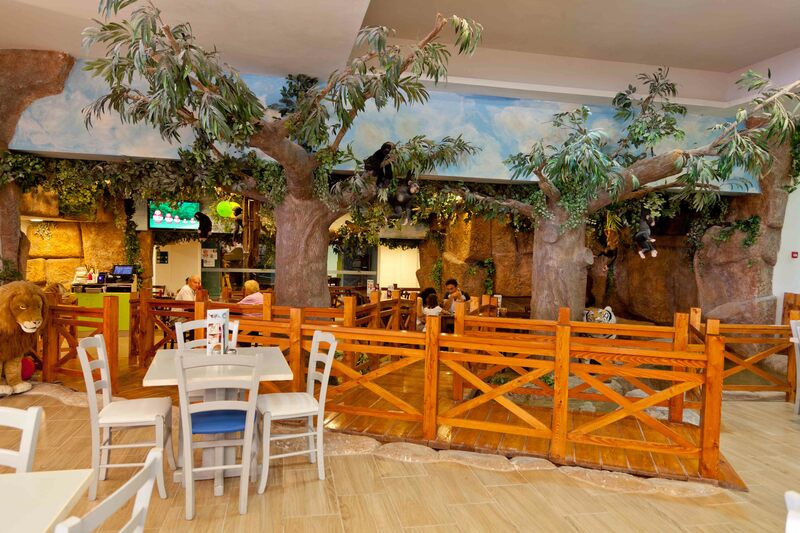 The Jungle American Style Buffet is a hit with both adults and kids thanks to its restful jungle theme interiors, and the massive playhouse right in the middle of the restaurant. The menu has all the familiar favourites for kids; burgers, pasta and pizza along with healthy and fresh side dishes make the menu a delicious one no matter what your age! Enjoy relaxing in the jungle settings as the kids go wild in the playhouse; it’ll be a success for the whole family. Thanks to the all-inclusive dining features at the db Seabank Resort & Spa, you can enjoy a wide variety of fresh tastes and cooking styles during your stay; from breakfast to dinner. You can check out the dining times and details at the resort below. 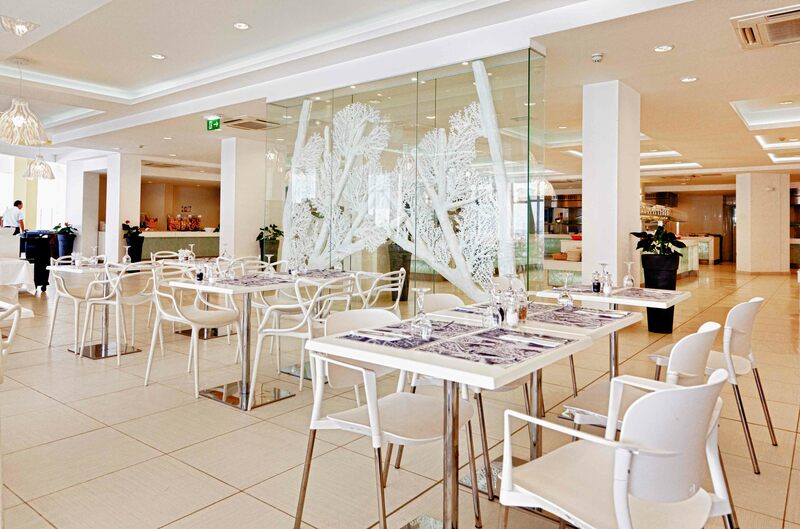 Served at the main Coral Restaurant, the sumptuous buffet-style breakfast features hot and cold meals; from a full cooked breakfast to pastries and yoghurt. The breakfast buffet is open from 7.30-10am. Holidays are meant for rest and relaxation, so what better way to enjoy your break than with a lie-in before enjoying a late breakfast. This continental brunch buffet runs from 10am-12pm at the Laguna Pool Restaurant. Served at the Coral Restaurant and the Laguna Pool Restaurant, lunch features fresh Mediterranean flavours such as antipasti and pizzas as well as mouth-wateringly tempting desserts. It is served from 12-3pm. It is your holiday after all, so why not indulge a little in a traditional afternoon tea. With sweet treats and snacks as well as a wide selection of hot and cold beverages, stop by the Laguna Pool Restaurant from 3-6pm. With an impressive 7 restaurants to choose from (not mentioning the ones you can find in the village of Mellieha) you really are spoilt for choice when it comes to your evening meal. Dinner times at the different restaurants vary; you will be advised when making your reservation at the Coral Restaurant or Pool Tower. The main restaurant (the Coral Restaurant) requires no evening booking with dinner from 6-9.30pm Monday-Thursday, and from 6-10pm Friday-Sunday. When the db Seabank Resort & Spa says it is all-inclusive, it really means it, so you can enjoy a wide choice of beverages during your stay. With house wine and beer, as well as a selection of local and international alcoholic beverages, you can unwind and relax at the resort. Tea, coffee, water and soft drinks are all freely available too, and with the self-serve beverage stations in the restaurants you can top up as you please. A stay at the luxurious db Seabank Resort& Hotel really is something special, not least thanks to the incredible cuisine that is on offer there. To book your dream holiday to Malta or to find out more about the resort itself, please click here to find out more about the resort.